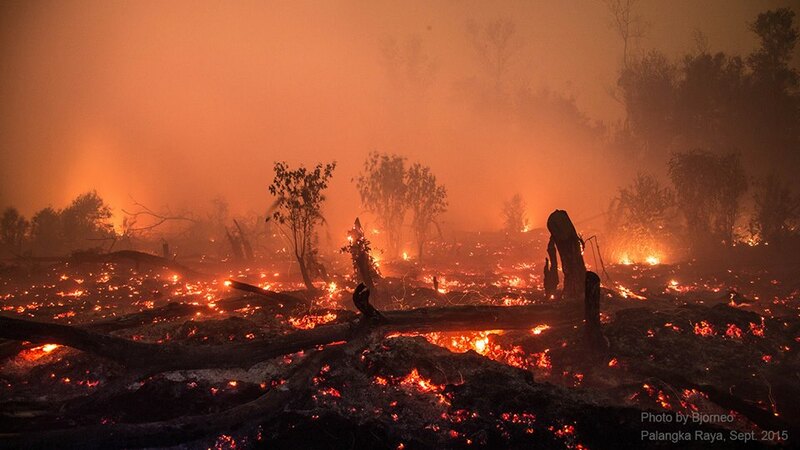 A night shot Björn Vaughn took of a burning peatland outside Palangka Raya, photographed during a film project this September 2015 (see Off the Charts article further below). Not much different from a lava landscape, the burning goes deep and resurfaces elsewhere. Note the flames bursting up towards the back, like mini volcanoes spewing magma. This is how peat fires spread for miles underground and by air. This is a battle firefighters cannot win. I find it remarkable that after several decades of forest and peatland fires and associated haze problems, governmental and non-governmental organizations are still barking up the wrong tree in the fire and haze blaming game. In a recent Jakarta Globe article, President Joko Widodo talks tough on fires and haze, blaming "disobedient plantation companies for setting the fires to clear land for planting." Similarly, the article quotes environmental activists who point to plantation companies for being the biggest cause of fires and haze. Dear oh dear, does anyone ever read the studies about causes of forest fire and haze in Indonesia? Apparently not. Or maybe people do, but they prefer to ignore the facts and reiterate the more convenient fictions. So I say it again, just in case there is someone out there willing to listen. Studies of fire and haze in Kalimantan and Sumatra firmly point towards small-scale farmers and other under-the-radar, mid-scale land-owners, rather than large companies as the main cause of fires and haze. A study published in August 2015 in the journal Environmental Research Letters clearly shows that on Sumatra 59 percent of fire emissions originate from outside timber and oil-palm concession boundaries. These non-concession-related fires generated 62 percent of smoke exposure in equatorial Southeast Asia (primarily Singapore and Malaysia). In Kalimantan, non-concession fires play an even bigger role. Fires outside concessions generated 73 percent of all emissions and 76 percent of smoke affecting equatorial Southeast Asia. These findings are in line with similar results based on more detailed studies in Riau and published in Nature in 2014. In Riau, 52 percent of the total burned area in 2013 was within concessions. However, 60 percent of these burned areas were occupied and used by small-and medium-landholders. The key point is that the fire and haze problem in Indonesia is complex, with multiple actors playing a role. Focusing on large concessions alone, which the Indonesian government and also non-government organizations seem to do, is not going to do much to reduce the problem. If the president wants “no more forest fires next year,” his government needs to get realistic about real causes and think about how to address these effectively. Anyone who has ever spent time in Kalimantan or Sumatra during the dry season knows that burning land for agriculture, for hunting, or just for fun is a favorite pastime of many. Most districts have laws in place that prohibit this kind of burning, but the big issue is that no one pays any heed to these laws and consequently they are largely ignored. If the Indonesian government really wants to reduce the fire and haze problem it needs to get far more specific in its management. Setting up task forces that look out for fires so that they can direct fire-fighting helicopters and cloud-seeding activities in the right direction are mostly window-dressing and won’t do much to reduce the underlying problem of Indonesia’s many million arsonists. An expert meeting on the fire problem on Aug. 25 similarly recommended shifting the emphasis from fire-fighting to fire prevention. First, and most immediately, you start with law enforcement. You get the army and police involved to track down anyone illegally setting fire to land, and take legal action. If the law says burning is illegal, prosecute the perpetrators -- how hard is that? You advertize burning prohibitions widely, through radio, television, newspapers, social media, billboards, and public speeches by governors, district heads and others. And you make sure that everyone understands that this time it is serious. In the longer term, Sumatra and Kalimantan may need somewhat different approaches. On Sumatra, where most fire emissions are generated from peat lands, the government has to stop giving out concession licenses on coastal peats. As I argued before, plantation development in coastal peatlands is unsustainable and will cause major economic losses to Indonesia. These peat lands need to be reforested and their original hydrology restored. That is the only way to stop peat burning. In Kalimantan, where burning by local communities plays an even bigger role than in Sumatra, the focus may need to be more on stopping unsustainable slash-and-burn cultivation activities, especially in peat lands. Develop solid agricultural support programs that provide subsidies for non-destructive land uses that use more advanced fertilization and irrigation techniques and higher-yield crops. Ultimately, Indonesia urgently needs to start taking the costs of development into consideration and not just focus on the benefits. Fires and haze, just like flooding, water pollution, increased temperatures following deforestation, and other issues are costing society tens of billions of dollars in damage annually, but this is rarely noted by those in power. Fires and haze alone caused $3.5 billion of losses to Indonesia in the past few years, according to the Jakarta Globe. Who is counting the costs of floods that increase with deforestation and displace up to half a million people annually in Kalimantan alone? And has anyone even tried to estimate the major economic impacts of the much higher temperatures that prevail after a forest has been turned into a grassland or plantation? Communities complain a lot about the heat, the associated reduced crop yields, and the disease outbreaks. They know the costs, but who else is listening? The science is there to inform decisions on all levels of government and to find lasting solutions, for Indonesia's own sake.